Seller of designer rags, and a cook — to mention only a few things. With more than 950 publishing credits, Charlee has been writing dark poetry and prose for more than 25 years. Some of her recent publishing events include the novel STILL (Necro), the poetry collection HERESY (Necro), and the novel DARK MOODS. She is a three-time Bram Stoker Award winner, two of those awards for her novel DREAD IN THE BEAST and the poetry collection SINEATER; the third award for collaborative poetry collection, VECTORS, with Marge Simon. Permanently disabled, she has begun to paint as one of her forms of physical therapy. To see some of Charlee’s paintings, click here. She lives in Irving, Texas with her husband Jim and a plethora of felines. To view a bibliography of Charlee’s works, click here. (Note from Sumiko: I snagged that photo from John Everson’s webpage… which is HERE. I was tickled by the image because John Everson is one of the first authors I interviewed back when “Things That Go Bump In My Head” was brand new. The bio is from Charlee Jacob’s website). 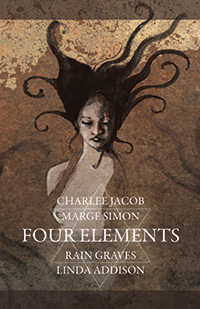 Four Bram Stoker Award™ winning poets join together to paint a rich, dark tapestry of evocative emotion in The Four Elements. From modern interpretations to ancient mythology, they explore the magic and mystery of Fire, Water, Earth, and Air. Their vivid poetry and prose brings to life a universe in a grain of sand, taking the reader through a journey of discovery from the inside out. Hear the hot voice of invisible awareness in Linda Addison’s interpretation of Air. Explore the realm of ethereal and surreal liquidity in Rain Graves’ Water. Burn from crevice to crown in Charlee Jacob’s wild-eyed visions of Fire. Contemplate Marge Simon’s poignant twists of dark irony to eruptions of spontaneous wonder in Earth. There is something for everyone in The Four Elements–conjured especially for the reader that likes to examine the meticulous depth and meaning in every word. Q. First of all, let me say that I am very excited to have the privilege of interviewing you. You are one of the very few women who writes pure, shocking, gruesome, edge-of-the abyss style horror. Why do you think there aren’t more women associated with the genre? You are truly a master of horror – your novels offer beautifully rendered yet deeply disturbing worlds, with a viscerally disturbing impact on the reader. What inspires to to write such intensely dark works? Many women may prefer to write more traditional fiction. Maybe they’re seeking romance or adventure or other outlets for escapism. And there are other women who simply consider it unladylike to work with such socially unacceptable subjects. It took me 40 years to even begin to remember, to confront, and write about the ugliness—about what I knew. Although, at first, I didn’t understand what was wrong. I would sit at my desk, crying for hours as I wrote This Symbiotic Fascination. At my first convention I was so shy and freaked out that I couldn’t talk to anybody. Some stared at me as if I was the devil’s pet minion. It didn’t help that, although I was unaware of it, I already showed certain traits for Parkinson’s disease and other maladies. I don’t intend to suggest that all women who write or read material of an extremely dark nature are the recipients of way too much post traumatic stress. Maybe writing it is a form of witnessing (even if the plot has little or nothing to do with the genuine atrocities that spawned it). But it’s my reason. And I’ve caught hell for it from arrogant assholes and so-called colleagues who ought to know better. But for them I suppose it’s easier to pass judgment, than it is to have any. Q. I am pleased to be interviewing all four of the women involved in “Four Elements” for Women In Horror Month. How did you chose “Fire” and what does the element symbolize for you? A. I originally wanted to do a different element but the only one left was fire. But fire may suite me the best, since I seem to have been damned for my work. But fire can also be said to cleanse, excite, fascinate, regenerate. Just ask any phoenix. Q. What was it like working with three other female Bram Stoker Award winners, Linda Addison, Rain Graves and Marge Simon? A. Actually I was the first to finish my section by two months. Due to Parkinson’s, Osteo-Arthritis and Fibromyalgia (with some other maladies), it made (and makes) it difficult due to constant tremors. I can’t correctly strike the keys and my handwriting looks like a monkey with his hands full of figs has been writing in Sanskrit. I can’t sit up for long, can’t raise my head, and rarely try to get away from my wheelchair. So I didn’t read most of the e-mails from the others. The only one of the ladies I’m ever in contact with is Rain Graves. This is at Christmas when she comes from San Francisco to visit family here. Q. Sometimes when I tell people I write horror and science-fiction, they say “I don’t like” or “I don’t read” horror, and only want to hear about the sci-fi. And I noticed perusing your reviews on Amazon, the number of people who would say, “well this book is great in spite of being horror”. Do you think horror still suffers a lot of genre bias? A. Horror is the stepchild of the fantastical genres and the outlaw of all literature. Q. 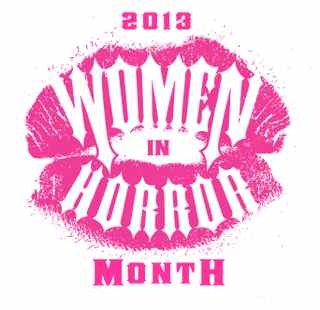 This is Women in Horror Appreciation Month – which exists to bring attention to women in horror, who are still under represented. Why do you think women are under represented in the genre? A. We tend to be under-everything in this and most other fields of endeavor. We’re under-represented, underpaid, and treated as if we were seeking to do “work unsuitable for a lady.” Agents and publishers want and need to make money, and they don’t believe a woman can pull in the business. Q. Do you have anything new coming down the pike that our readers can look forward to? A. I only just began a little writing after several years. A new publisher has requested a book. The handwriting in the original version is complete. It’s a collection of very short fiction and some essays on the nature of living with this disability (which I’m told the eventual outcome of will be dementia) and on writing horror. I have a new book of poetry I haven’t sent out. There are three novels—unpublished. The first is past it’s time, the second isn’t particularly extreme, and the third I was asked to write. When I sent it to the publisher, he said it was beautiful and brilliant and that my readers were too stupid to understand it. He wouldn’t publish it. I also have some short fiction. ~ by Sumiko Saulson on February 25, 2013.